Unlike ordinary double-glazing, Pilkington energiKare™ works in two ways making your home perfect all year round. 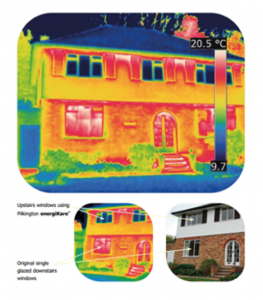 In the winter, a Pilkington energiKare™ IGU will help to reduce heat transmittance through windows and will keep your home a consistent temperature throughout the colder months. However, in the summer months, it will help keep your home warm by allowing more of the sun’s heat energy to enter your home in a process know as solar gain. As a result, your home will become more energy-efficient, helping you make a noticeable saving on your energy bills.